I've talked before about wasted food here, here and here. 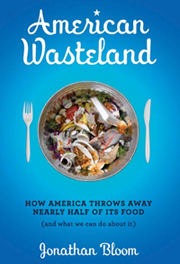 According to Jonathan Bloom, author of American Wasteland, we toss enough food every day to fill the Rose Bowl. That's a lot of wasted nutrition, effort, and money, not even considering the negative environmental impact and the whole there-are-kids-starving-in-X-country guilt factor. This was on my mind as our family prepares to go out of town and leave the fridge unsupervised, all its remaining contents moldering quietly, only to be rediscovered and tossed on our return. Not this time, I vowed! Add the vegetables, paprika, garlic, bay leaf, salt and freshly ground black pepper. Cook, stirring frequently, for 6-7 minutes, until the onions and celery begin to soften. Add the chickpeas, tomatoes, hot sauce and chicken broth or stock to the pot then raise the heat to bring it up to a bubble. Once bubbling, reduce the heat slightly and simmer the soup until the potatoes are tender, 10-12 minutes (cooking time will depend on the size of the potato pieces). Remove the bay leaf before serving. Then last night I checked out the "crisper" drawer and found spinach, bell peppers, and green beans that would not survive our absence. If you like stir-fries, try this one, inspired by a recipe for Chinese-Style Spicy String Beans from Bon Appetit. Whatever vegetables you want to use up. (Keep in mind that longer-cooking vegetables like broccoli and green beans should be pre-steamed for a few minutes so that they cook in the same amount of time as leafy greens.) Slice or chop the hard vegetables to stir-fry size. I left the spinach alone because it wilts down. Heat 1 Tbsp oil in medium skillet till good and hot. Saute vegetables until tender-crisp. Add sauce ingredients. Mix water and cornstarch and add to pan. Heat till sauce thickens. Sprinkle with scallions and sesame seeds. For more great tips, check out Jonathan Bloom's "15 Ways to Stop Wasting Money on Food," as reported in U.S. News and World Report. Some tips are familiar (eat leftovers, don't shop hungry); others might challenge us (cook more, grow your own herbs). In any case, they're great reminders and worth a read. As always, when you shop the Bellevue Farmers Market, ask the farmers how long things will keep, whether they can be frozen, what their favorite uses are, what they like to do with leftover X. Ask your fellow shoppers, as well. Sharing food know-how not only reduces waste, it builds community. The very best way to use up food? Invite friends over for a meal!